I know what you're thinking: "What a fabulous trophy! If only I could win something as tasteful and all-round wonderful as that." Yes, folks, this trophy, though it does have some bit of old marble for a base, is, for the most part, high-quality electro-plated plastic, and it gleams in the dark recesses of my mind. Against the background of lemon-yellow and violent-orange, the two naturally-posed figures on the disc near the base show that I won this for dancing. I am bound to say that my costume did not match the magnificence of those depicted. 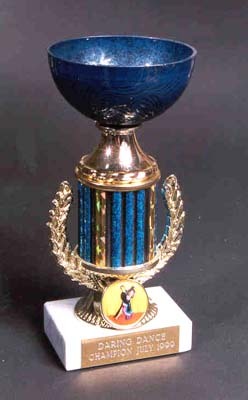 I have won other trophies, but never have I won something more elegantly restrained in its design.